This page has been updated with Methedras data (07/26/12). Hi there! I have been talking about this topic of skirmishing for marks for a while. I had been waiting until I collected a good enough representative sample of skirmishes to build my tables. There are some sites that are masters of knowing the lore behind what is going on in a skirmish. You won’t find that here. When I am skirmishing, I cathartically release worries out through the lightning in my fingertips and think less about what I am fighting. “See it & Kill it (& sometimes take its picture)” is my skirmish motto. What I never turn off is my mental math processors though. So, I took these notes and data about which skirmishes were the fastest to beat, and which awarded the most marks per minute, and a few other notes along the way as to why those skirmishes are paced as they are. Runekeeper/Herbalist: Your mileage may vary but the table below is built on my average statistics. I am a level 75 Runekeeper, lightning traited, reasonably-well-but-not-best-end-game geared, with a Herbalist (soldier build @ Herbalist) that is doing no damage but keeps me alive while I kill enemies. At least ideally, your statistics comparing one skirmish to another might be similar. These data were generated at Update 5 (prior to RK revamp of U6 which helped the RK to get a bit tougher though I doubt it will change this table noticeably). Encounters: I do every encounter (there are two per skirmish) which adds to the time. In some situations, like “The battle in the Tower”, some encounters require doubling back to areas that have already been passed. Depending on the encounter, it could add a couple of minutes to the skirmish time. While soloing, as most of the “Medallions” (not marks) come from the encounters, it is worth the time to do the encounters. Instance Finder: All of the stats in this post were generated while using the Instance Finder (IF). Why? The IF has a setting for “1 person”, “skirmish”, “Tier 1” and it will randomly choose a skirmish for you. By letting the IF choose the skirmish, you are awarded 50% more marks and medallions. Yeah, that is huge. Don’t leave home without it. Also, notice that you get +5% morale and power if you let the IF choose the skirmish. That's a lovely chocolate frosting for an already tasty chocolate cake. ***Note: Update 6 (03/12/12) changed the IF somewhat, but it should become even easier to use. Tier 1: All of the skirmish data are generated for Tier 1. Tier 2 skirmishes give +10% marks and Tier 3 gives +25% marks. However, T2 takes more than 10% more time than T1 (and T3 is much longer). For certain, T2/T3 foes hit harder and have more morale so if you have any problems at T1, then T2/T3 is probably not for you. T1/T2/T3 Comparing start to finish… I chose to clock Nurz Ghashu because the skirmish is very consistent. On T1, it always take me about 9 min 55 sec start to exit, +/- 20 seconds. So, T1 Nurz data = 10 min. T2 Nurz data = 13 min (+10% marks @ +30% of the time). T3 Nurz data = 24 min (+25% marks @ +140% of the time). The truth is I hit and run the same speed regardless of the tier. If the T3 mobs have twice the morale, I have nothing to speed up my kill rate to compensate. What are the fastest skirmishes? Here is my data table. Yeah, that is still a lot of data so I will break it down. There are three sections: around 12 minutes, around 15 minutes, around 20 minutes. This table has been updated with "Storm of Methedras". Offense/Defense: There are 10 Offensive skirmishes and 8 Defensive skirmishes. Offensive skirmishes let you plow through the enemies at your pace; some have stopping points where the enemy is “counterattacking an area” that you just took. Defensive skirmishes have enemies periodically running toward and attacking an area that you are “defending”, always with the assistance of an NPC (whom you are not allowed to let die lest you often fail the skirmish automatically). Top 7 fastest (above average speed): Of the top seven fastest skirmishes for me, 5 are Offense and 2 are Defense. Like I said, this post is not the end all of lore knowledge, but here are a few quick notes to guide us. (1) Strike against Danneglor: Offense (#1 Speed, #3 Marks/min) – This skirmish is the shortest skirmish; it is almost too short. There are various courtyards with control points. You go, you kill, the enemy counter-attacks, you move on. It doesn’t offer many marks, but it is so fast that it is good in terms of Marks/minute. (2) Rescue in Nurz Ghashu: Offense (#2 Speed, average Marks/min) – Similar to Danneglor, Nurz Ghashu is quick. It is set in the Rift and offers +700 Rift reputation for completion. If I complete it another 58 times, I will finally be at Kindred with the Rift people (the Eldgang). Kindred doesn’t get me anything except a stamp in my list that says I am kindred, but it is far easier to build Eldgang rep via solo skirmish than it is to get a raid team together to go run a level 50 Rift raid (which is the only other way to get Eldgang rep). (#) Storm of Methedras: Offense (Fast Speed, Great Marks/min) – Methedras is the "new one" for 1H12, and the reason I am updating this page on 07/26/12. It is a slugfest. 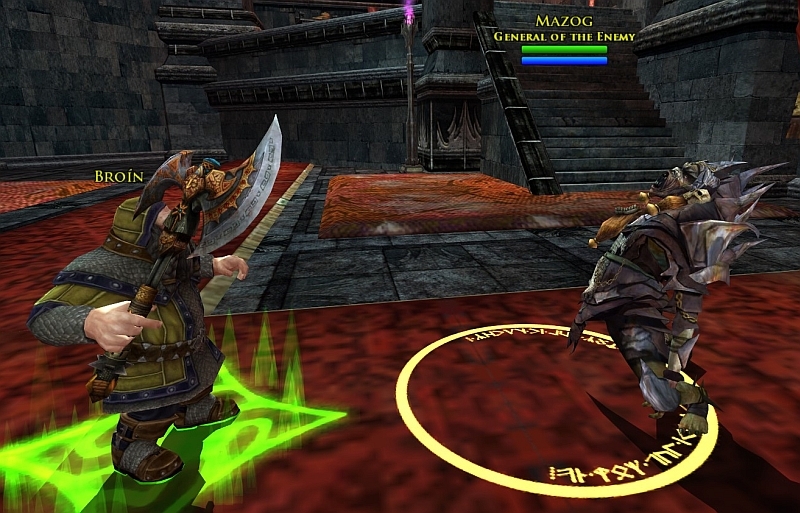 At the two gates, the mob roll toward you so it has both an offensive and defensive feel. A key is to not bite off more than you can handle as there is opportunity to aggro additional mobs inside the gate. Other than that, it is well laid out and straight-forward. Good for racking up marks quickly. (3) The Icy Crevasse: Offense (#3 Speed, #1 Marks/min) – The Icy Crevasse is notoriously the hardest of the 17 skirmishes. When I win without defeat, it takes about 12 minutes to complete. Fortunately, since it is the hardest, the payout is the best. There is no comparison when it comes to Marks/minute. The Icy Crevasse = 29 M/min, and the next closest is the Strike against Danneglor = 17 M/min. The Icy Crevasse has unique mechanisms for extra damage because of the cold environment and has occasional healing spots (the green spots) during the boss fight where you don’t die quite as fast. (4) Defense of the Prancing pony: Defense (#4 Speed, average Marks/min) – The Prancing pony is the fastest defensive skirmish. You mostly stand in one place out in front of the tavern and whack every enemy that comes along. There are enemies carrying fire to burn the tavern; kill them before they get to the Pony. Second watch Heathraw, a melee NPC, is out there helping. It is quick and easy with average marks. Here is Heathraw preparing us for the fight. (5) Attack at Dawn: Offense (#5 Speed, #4 Marks/min) – This skirmish is an offensive race through an orc camp in Mirkwood. There are some orcs, wargs, trolls, catapults dropping destruction in certain areas. It is fairly easy, fast, and one of the best for Marks/minute. (6) Thievery and Mischief: Offense (below average Marks/min) – This fight around Bree is a typical offensive skirmish. Kill stuff, counterattack, etc. It is offense driven, and fast, but the marks are on the low side. Kill the pig! Here is a shot of Goretusk, one of the encounters in Bree skirmish Thievery and Mischief. 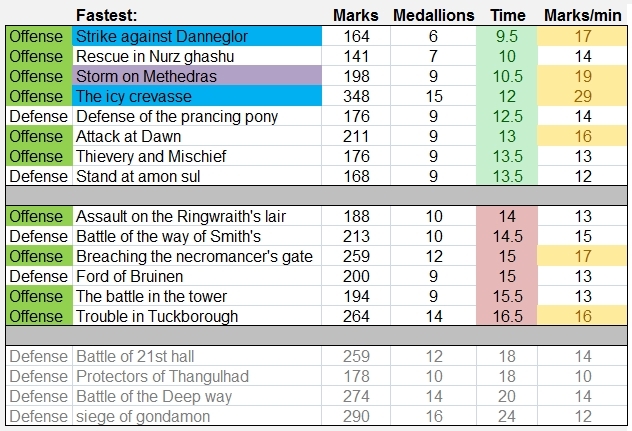 (7) Stand at Amon Sul: Defense (below average Marks/min) – With the Prancing Pony, Amon Sul is the other fast Defensive skirmish. Amon Sul is very busy and has a hectic feel. Your task is to light fires, the NPC Calenglad range kills most things, and when you are not lighting fires, you get to help kill. As long as the fires are lit, it is hard to lose. It is relatively short but the marks are poor. Next 6 Skirmishes (average speed): These next six skirmishes are not the fastest, but have a couple of high performers for Marks/minute. There are two Defensive and the remaining four Offensive skirmishes in this grouping. 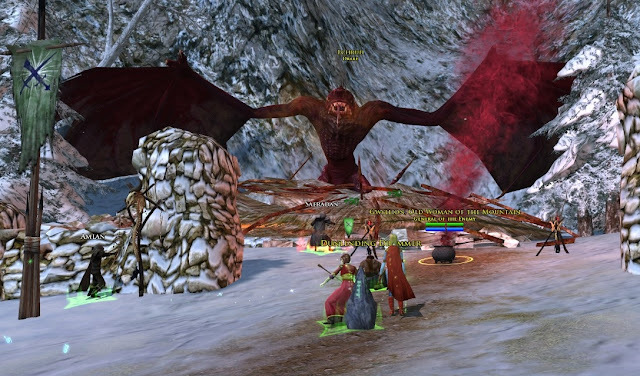 (8) Assault on the Ringwraith’s Lair: Offense (below average Marks/min) – It is another typical offensive skirmish. It is a race around Dol Guldur (open air, so not claustrophobic), kill stuff, counterattacks, kill the Ringwraith at the end. The length takes a bit longer since you are physically running across DG; the marks are poor. (9) Battle of the way of the Smith’s: Defense (average Marks/min) – The Smith’s is a defensive battle. You defend the east forge, the west forge, or the north forge and are alternating areas every couple of waves. There are several rounds of this defense. Then, you go upstairs and beat the boss troll Sadauk. 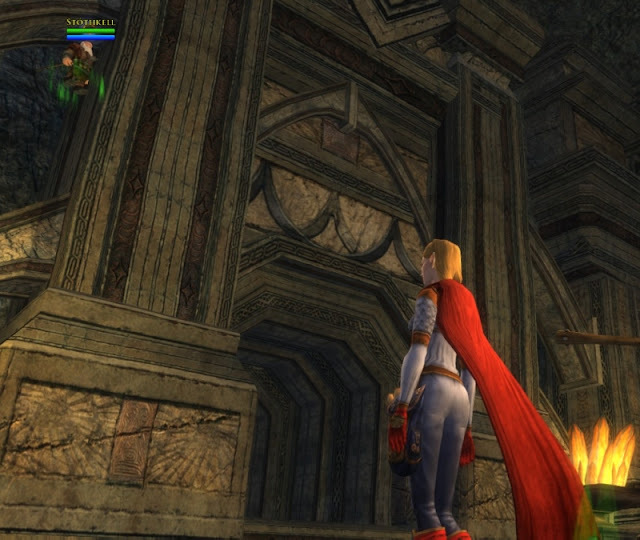 The area is within the mines of Moria; as an elf, I am not meant to be underground that long. It moves along ok; you have banners to help (offers extra damage, healing, power, etc, not that they are really needed); and the Mark payout is Average. Of course, when Stothkell get knocked back by the troll and gets stuck to the wall and the instance cannot be completed, that doesn’t help at all. (10) Breaching of the Necromancer’s gate: Offense (#2 Marks/min) – I often get this one confused with Assault on the Ringwraith. Both are open-air Offensive fights in Mirkwood/DolGoldur and take about 15 minutes. The Necromancer’s gate has much better marks though, ranking #2 for Marks/min. (11) Ford of Bruinen: Defense (below average Marks/min) – Defend the fords of Bruinen in the Trollshaws with Elrond’s boys. 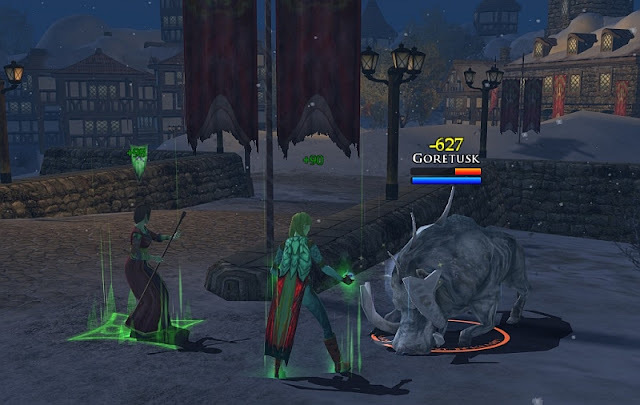 It is a lovely fight, defending from the left or the right, and has help from two elven hunter types. Takes an average amount of time, but the marks are low. (12) The battle of the Tower: Offense (below average Marks/min) – For the most part, the offensive battle of the Tower is really fast! Where this one breaks down is the very long monologue by Mazog at the end. He seems to go on and on in his villain monologue until Broin cuts his throat and makes him stop talking. Marks are low for its length. The Last 4 Skirmishes (takes so long...): Given the choice, these four Defensive skirmishes are not my favorite skirmishes. (14) Battle of the 21st Hall: Defense (average Marks/min) – The Marks are not that bad, but at 18 minutes and lots of dead space between defense positions around 21st Hall, the Battle drags by comparison to some of the other skirmishes. You get bonus banners and typical NPC defenders. (15) Protectors of Thangulhad: Defense (below average Marks/min) – The basic fight of this skirmish is the easiest of all the skirmishes. You shoot catapults at the enemy as they run to Thangulhad. If you hit them, they are nearly dead when they arrive at Thangulhad camp and are one-hit knockouts. If you miss, the fight is still easy, especially with the melee NPC assistant. The encounters are out of the way and many of the encounter foes do not stick around… they are walking and you have to know where they are to get to them in time. With its long length and low marks, even though it is easy, the skirmish ranks worst for Marks/min. (16) Battle of the Deep Way: Defense (average Marks/min) – Like the 21st Hall and the Smiths, this defensive battle of the Deep Way is in Moria. You defend the south tunnel, north tunnel, or middle area, and you get NPC helpers and banners. At 20 minutes, I could have finished Strike against Danneglor twice and felt more fulfilled with better marks. (17) Siege of Gondamon: Defense (below average Marks/min) – Oh Gondamon. Before I even started tracking how long this skirmish was, I was keenly aware that it was very long. “I am still in Gondamon? ?” At approximately 24 minutes, it is by far the longest skirmish of the 17 available. Its marks are not bad, but it is not at all proportionate for the length of the skirmish. Relic Extras: I almost forgot! In addition to Marks and a few Medallions, you also often get LI relics as drops and rewards. I noticed no obvious difference for relic reward by skirmish. On average across all skirmishes in the data set, I received 1 tier 3 relic, 1.5 tier 2 relics, 3 tier 1 relics, and 8% of the time I received a 40k ixp rune. The variance was wide from no extras at all to 2 t3, 5 t2, and 10 t1 for a single skirmish. Favorites? Do I have favorites? I would have to say I tend to like the offensive ones better, especially the first Seven of Nine. Besides the fact that they are longest, Mazog in the Battle in the Tower annoys me and Trouble in Tuckborough is very dark so those two are my least favorite. The only defensive ones I could say I really like are Defense of the Prancing Pony and the Ford of Bruinen. 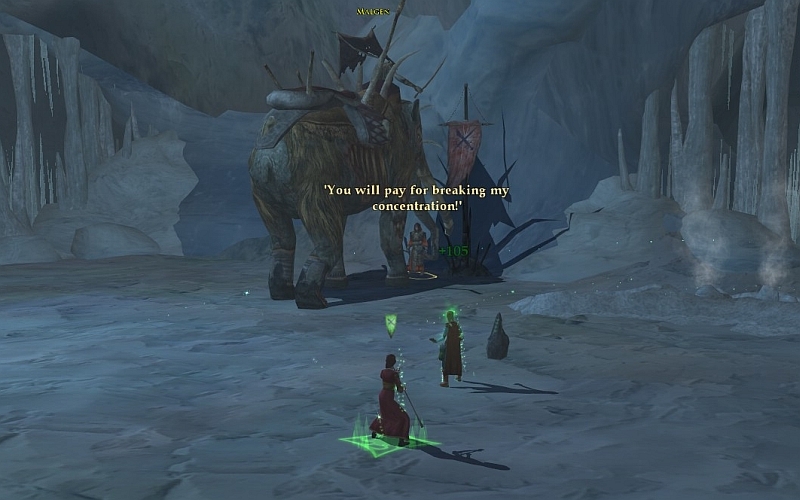 Given a choice, I don't go fight underground in Moria. With the new IF for Update 6 (03/12/12), as I understand it, the "Advanced" IF tab will allow certain skirmishes to be removed from the random select and you will still get the 50% mark bonus and +5% morale and power. If so, I may never go to Gondamon skirmish again. :) ***UPDATE to Post, 03/16/12: The new IF does have an "Advanced" tab and is very friendly to use. Read my comments on it here (old-halls-of-crafting-new-galtrev). This was so useful for me, as a relatively n00b skirmisher... I had no idea the instance finder could work that way! Definitely going to start using it like that. Wow, Dana, this is extremely useful! =) Especially for me, whereas I'm relatively new at skirmishing compared to some of you. Wonderful! The new Instance Finder for Update 6 should work the same way. The IF is the #1 easiest way to maximize your marks. If you don't like a particular one the IF chooses, the IF will allow you to get another random one in 10 minutes, which is easy enough to blow through (AH shopping, daydreaming, chatting with friends, or even slayer deeding on the open landscape). The marks will be less at skirmishes lower than 75, but I suspect the relative time lengths are similar. Yay for cotton candy clouds! Yay for you Asma! Glad I could help. Yeah, it's quite less reward-wise, but the times are about the same from what I've seen with 'Attack at Dawn' and 'Thievery and Mischief'. I should try that, leaving the IF open to all of the skirmishes then selecting go. 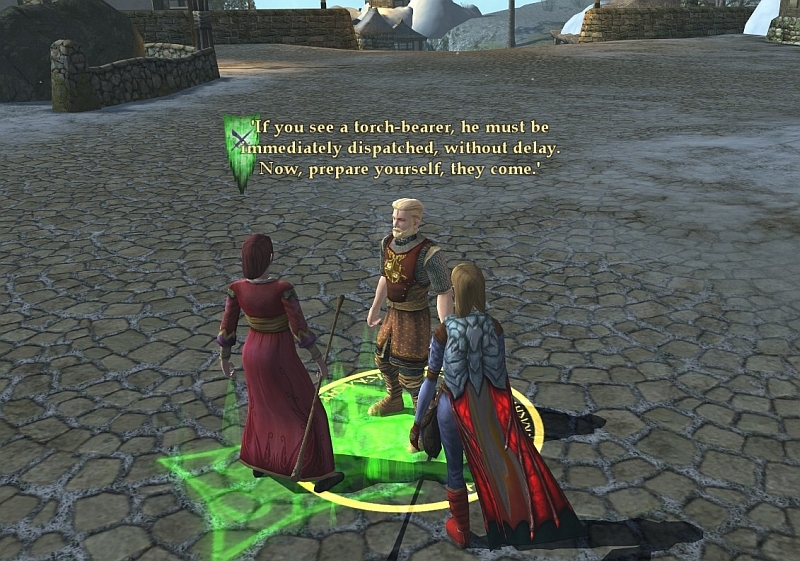 (I didn't actually know you could do that, hehe) Even if I get stuck with one of the duller ones, it would work for completing the deeds that affiliate with each of the skirmishes. I just want to mention that I re-read this every time I skirm. Which is often. I'm very glad you and others find value here. and maybe even a drop chance to crystals? I definitely will add Methedras to this list; I just need to take enough time out from festivalling to get a good statistical sample & compare it to how I've changed my personal speed since this March list. I'll mention Methedras in (or as) a new post, then Update this list to include the new info. As for crystals... according to my results the drop rate is 0-fer. lol! I was half-thinking them to be a myth until someone else mentioned that they had gotten a few. :D I'm personally interested in how it changes the LI numerically. Great site! Very useful. Many thanks! Much obliged! Oh, anyone else seem to notice that running size 2 or more skirms by yourself doesn't seem to gain any extra marks? Awesome, as always! Thanks for the info! This article is still one of the most popular ones at danania.net. I'm glad to see that so many people value it! I mean to do a comparative data set for what speeds look like at level 85 with accompanying loot data but I haven't gotten to it yet. The data set that built these tables took several hundred skirmishes. Mebbe this summer, lol.